An anti-tumor drug. Letroxyl has antiestrogenic effects, selectively inhibits aromatase (estrogen synthesis enzyme) by a highly specific competitive binding subunit of the enzyme – heme cytochrome P450. Blocks the synthesis of estrogens in peripheral and in tumor tissues. In post-menopausal women, estrogens are mainly formed by the enzyme aromatase, which converts adrenal androgens (primarily, testosterone and androstenedione) to estrone and estradiol. Daily Letrozole intake of a daily dose of 0.1-5 mg reduces concentrations of estradiol, estrone and estrone sulfate in plasma at 75-95% of the initial content. Suppression of estrogen synthesis is maintained throughout the treatment. In applying the Letroxyl drug in doses ranging from 0.1 to 5 mg disorders synthesis of steroid hormones in the adrenal gland is not observed, the test does not detect ACTH synthesis of aldosterone or cortisol disorders. Additional destination glucocorticoid and mineralocorticoid is required. Estrogen biosynthesis blockade leads to accumulation of androgens, which are precursors to estrogens. In patients receiving Letroxyl, changes in the concentrations of LH and follicle-stimulating hormone in blood plasma, changes in thyroid function, lipid profile changes, increasing the frequency of myocardial infarction and stroke have been reported. In the treatment of osteoporosis, Letroxyl slightly increased frequency (6.9% compared with 5.5% in the placebo group). However, the incidence of bone fractures in patients receiving the drug Letroxyl, is no different from that in healthy people the same age. Letroxyl adjuvant treatment of early breast cancer reduces the risk of progression increases disease-free survival at 5 years, reduces the risk of another breast tumor. Extended adjuvant Letroxyl therapy reduces the risk of progression by 42%. Significant advantage in disease-free survival in the group Letroxyl noted regardless of the involvement of lymph nodes. Treatment with Letroxyl reduced mortality among patients with involvement of the lymph nodes is 40%. For adults, the recommended Letroxyl dose is 2.5 mg 1 time/day, every day for a long time. As extended adjuvant therapy, treatment should continue for 5 years (no longer than 5 years). When you see signs of disease progression receiving Letroxyl should be discontinued. For older patients, Letroxyl dose adjustment is required. In patients with impaired liver and/or renal impairment (creatinine clearance ≥ 10 ml / min) dose adjustment is required. However, in severe hepatic dysfunction (class C Child-Pugh), the patient should be kept under constant surveillance. 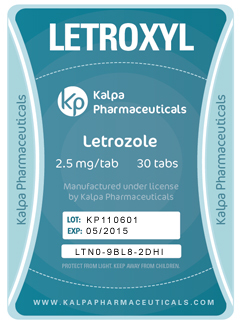 Generally, Letroxyl side effects were mild or moderate, and are mainly related to the suppression of estrogen synthesis.